I have a fun and creative craft for you today. 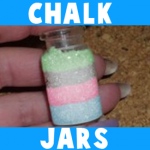 I’m going to show you how to make Chalk Sculptures simply with a pin and some blackboard chalk. 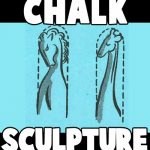 I give you some examples of things to make with your chalk sculptures, but please feel free to use your imagination to make whatever you would like with your chalk sculptures. The choices are virtually endless of the things you can make. So, grab the materials needed and let’s get started.